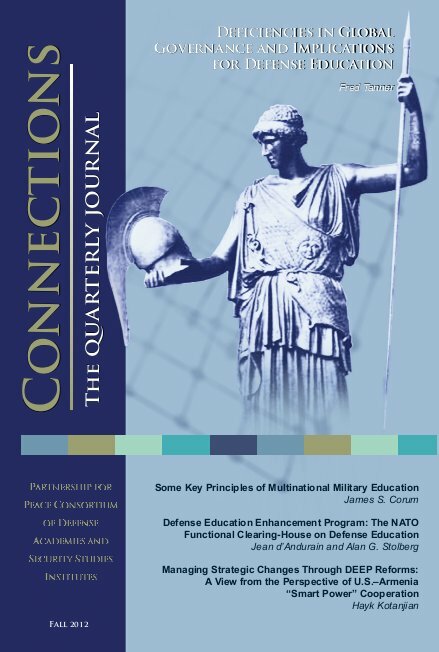 The Fall 2012 issue of Connections: The Quarterly Journal is dedicated to defense education reform in partner countries and the role the PfP Consortium and NATO play through the Defense Education Enhancement Program. It covers requirements to modern professional military education and the way advanced Western educational institutions approach these requirements, including through joint and multinational approaches, emphasis on the learner and the opportunities for networking advanced technologies provide. Individuakl articles present the experience of Armenia, Azerbaijan, Moldova, Kazakhstan, and Bosnia & Herzegovina, and the advances these partner countries have made through the exchange with experienced educators from NATO countries. Tanner, Fred. "Deficiencies in Global Governance and Implications for Defense Education." Connections: The Quarterly Journal 11, no. 4 (2012): 1-9. Corum, James S.. "Some Key Principles of Multinational Military Education." Connections: The Quarterly Journal 11, no. 4 (2012): 10-26. Berry, John. "Defense Education Enhancement Program: The Consortium Perspective." Connections: The Quarterly Journal 11, no. 4 (2012): 27-33. Barrett, Jim. "Education for Reform: New Students, New Methods, New Assessments." Connections: The Quarterly Journal 11, no. 4 (2012): 34-42. Reid-Martinez, Kathaleen. "Overcoming the Challenge of Legacy Learning Methods." Connections: The Quarterly Journal 11, no. 4 (2012): 43-51.
d’Andurain, Jean, and Alan G. Stolberg. "Defense Education Enhancement Program: The NATO Functional Clearing-House on Defense Education." Connections: The Quarterly Journal 11, no. 4 (2012): 53-58. Keagle, James M.. "A Special Relationship: U.S. and NATO Engagement with the Partnership for Peace to Build Partner Capacity Through Education." Connections: The Quarterly Journal 11, no. 4 (2012): 59-73. Gawliczek, Piotr. "Showing the Way: Contributions from NATO’s Newest Members." Connections: The Quarterly Journal 11, no. 4 (2012): 75-82. Kotanjian, Hayk. "Managing Strategic Changes Through DEEP Reforms: A View from the Perspective of U.S.–Armenia “Smart Power” Cooperation." Connections: The Quarterly Journal 11, no. 4 (2012): 83-90. Fedyszyn, Thomas. "Moving Westward: The Azerbaijan DEEP Experience." Connections: The Quarterly Journal 11, no. 4 (2012): 91-97. Troxell, John F.. "The Moldovan Military Academy: Transforming Officer Education." Connections: The Quarterly Journal 11, no. 4 (2012): 99-107. Stolberg, Alan G.. "Defense Education Enhancement Program: The Kazakhstan Experience." Connections: The Quarterly Journal 11, no. 4 (2012): 108-113. Vetschera, Heinz. "Politics and Higher Military Education in Bosnia and Herzegovina: A Missed Opportunity." Connections: The Quarterly Journal 11, no. 4 (2012): 114-126.